Many people have run birth charts on Donald J. Trump in the past two years, also charts on his announcement he was running for president and on his own inauguration (which BTW was very poorly attended despite his protestations to the contrary). But I don’t think I have seen anyone compare his chart to the George Washington inaugural which I feel is a key chart for determining the merits of a candidate. The other charts I mentioned may show what kind of person he or she is, or what kind of candidate he or she is, but the GWI chart comparison should show what kind of president he or she will be, and whether he or she will be good for the country. Now that Jupiter is firmly in Leo, it is fun to see ways in which Jove (and Venus too) are beaming their positive rays on that sign. I noticed an article in a recent copy of the Wall Street Journal that detailed how two companies were returning bountiful profits for investors. What companies were they? Two movie studios – MGM and Lion’s Gate!!! How perfect is that? MGM’s trademark is the iconic Leo the Lion roaring a greeting at the start of each film, and Lion’s Gate, well that one is obvious, too, with the name of the animal that represents the sign Leo. MGM has seen huge box-office receipts on the strength of films like the James Bond thriller “Skyfall” and “The Hobbit- An Unexpected Journey.” Each one brought in over one billion dollars, and continues to sell tickets overseas. MGM also has the TV show “21 Jump Street” and a deep catalog of films in its library to sell copies in international channels and digital services, according to the WSJ. This is a major turnaround since it was forced to file bankruptcy in 2010. MGM was born on April 17, 1924. I was surprised to see so much cardinal energy in their chart. The Sun is at 27 degrees Aries, square Mars at 25 degrees Capricorn (a strong placement for that planet), opposite Saturn exalted in Libra (29 degrees), and trine its North Node at 29 degrees Leo, a perfect placement for an entertainment business. Not only is the T-square a strong driver for the chart, the planets involved are also in the very late degrees of the signs. Let’s see, what did I write about late degrees of these signs? The Sun in a late degree of Aries denotes someone that is a pioneer in some way, and MGM was very much a pioneer. It had not only the most glamourous collection of stars (with names like Clark Gable, Carole Lombard, the Jeanette MacDonald-Nelson Eddy musicals, Spencer Tracy, Myrna Loy, Greta Garbo, Joan Crawford and many more), it also boasted several firsts. While it was one of the last studios to adopt sound, it was the first to make a complete film in Technicolor with sound (The Viking), as well experimenting with it for portions of Ben-Hur and a few other films. They also virtually owned the big-budget musical segment of the film industry. Mars in late Capricorn has high energy, which would have made for an excellent athlete in an individual chart. Any planet in late Capricorn is powerful for building a business, especially a business that survives the death of the founder. And indeed, the fact that this company is 90 years old and still going strong is a testament to a strong Mars here. Saturn in late Libra: Saturn in Libra is exalted anyway, meaning that it is strong, and the energies of that planet find ease in expressing itself in a positive way. Venus-ruled Libra is known for famous dancers and other entertainers. Famous dancers with a planet in late Libra include Ben Vereen, Fayard Nicholas, Arthur Duncan, and Juliet Prowse. Libra looks for the beautiful and tends to shun the gritty side of life. This was the philosophy of co-founder Louis B. Mayer, who preferred the glorious color and musical spectaculars like Show Boat, the Andy Hardy films, The Ten Commandments, An American in Paris (1951), Singin’ in the Rain (1952), Seven Brides for Seven Brothers (1954) and Brigadoon. And having the North Node at 29 degrees Leo would be an obvious boon for any company in the entertainment industry, and for major growth and even dominance in the minds of the public. It did not hurt that its Stable of Stars included The King, Clark Gable! MGM gets a boost from both Jupiter and Venus transiting Leo, contacting the natal Neptune (glamour) at 17 degrees and the North Node at 29 degrees. MGM emerged from bankruptcy in December 2010, when Pluto at 4 degrees Capricorn passed the square to natal Moon at 3 Libra and natal Ceres at 3 Aries. During the lean years, Neptune was opposing its natal place in Leo; now that Neptune is transiting Pisces, that transit no longer depresses box-office receipts. Lion’s Gate profits have rested on properties like the “Hunger Games” franchise (with two more in the works). Lion’s Gate’s birth date is listed as July 3, 1997. The Lion’s Gate natal chart also has a strong cardinal component, with Sun at 11 degrees Cancer, the Moon at zero degrees Cancer, Mercury at 21 degrees Cancer, Mars at 6 degrees Libra, Saturn at 19 degrees Aries, and Neptune (glamour) at 29 degrees Capricorn. Neptune is the only planet at a strong late degree, and promises that the company will survive through thick and thin. Transits that have lifted its fortunes: the main one is the progressed Moon (now at 9 degrees Aquarius) has recently conjuncted natal Uranus at 7 degrees Aquarius; this would account for lucking onto the Hunger Games franchise, with its strange, even bizarre public appeal. The other is that progressed Sun at 28 Cancer opposes natal Neptune, added a high gloss of glamour to its offerings. A caveat to those interested in investing in the company now: progressed Mars is applying to an opposition to natal Saturn. That seems to me to be a negative for financials, especially in regard to handling debts and commissions. In the short term, Jupiter in Leo will contact the natal Venus at 6 Leo, and sextile natal Mars at 6 Libra; that should prop up the business in the short term; once Jupiter leaves Leo though, public appeal will probably deflate in short order. Hello, astrology students! Today’s lesson is about how to look at Eclipse charts. Actually I will talk about a way of looking at a Solar Eclipse, and a way of looking at a Lunar Eclipse. First, the Solar Eclipse. This method is SOLELY for Solar Eclipses. The proponent of this method is Dave Roell of AstroAmerica aka Astrology Center of America. You can look for a more detailed explanation of his method in the June 11 issue of his newsletter at his website, AstroAmerica dot com. The first step is to cast a chart for the Solar Eclipse set for your locality – or where you will be at the time of the Solar Eclipse. Take care to convert the time, which is probably given as Eastern Time or Pacific Time, to your own time zone. Note carefully where both the Sun-Moon and the Nodes fall. Dave notes that Judith Hill notes that solar eclipses are polarized along the lines of the node. I might add that total eclipses occur when the node is 5 degrees or less away from the sun, and partial eclipses occur when the node is more than 5 degrees from the sun. As a general rule, anyway. So, in other words, says Dave, eclipses are really more like hyper nodes – maybe I should capitalize that like this: Hyper Nodes. Dave simplifies his key to solar eclipses like this: FIRST, note the HOUSE that the eclipse falls in; this will clue you in to the SETTING of whatever event is triggered by the eclipse. SECOND, “convert the SIGN of the eclipse to the house on the “natural” or Aries rising wheel.” The sign will clue you in to the kind of EVENT is triggered by the eclipse. If the sun and the node fall in different houses, the node is preferred – BUT you will have to look at both and make a judgment on which is more active. Also bear in mind which node the eclipse occurs near, because this will clue you in to whether to expect gains or losses. A North Node eclipse will tend to bring you things or bring a new beginning, and while a South Node eclipse will tend to take something away, or end a situation. A good example is the eclipse before the Wall Street meltdown of 2008. There was a solar eclipse on Aug. 8, 2008 at 6:14 am; set the chart for New York City. The South Node is in the first house, affecting the whole world. It is in Leo, and Leo (in a natural, Aries-rising chart) is ruler of the fifth house of speculation, in other words things like the stock market – which duly crashed that fall. I do have a little trouble applying it to the Aurora, CO Batman shooting, tho. The shooting occurred in a movie theatre on July 20, 2012 at 12:38 am to 12:45 am MDT. The Solar Eclipse prior to the shooting was on May 20, 2012 at 5:23 pm MDT. I have cast a chart for the eclipse, so have a look. The lights are in the eighth house, as one might expect. The eighth house indicates death only sometimes, but here it is literal. Other possibilities would have included beginnings and endings, intense situations, absolute decisions (meaning ones that cannot be taken back), money given to others to manage, a spouse’s money, pooled funds of all kinds. It occurred in the sign of Gemini, which falls in the third house in an Aries-rising chart. The third house rules daily life, errands, siblings, etc. Well that does not seem to fit. However, it would rule malls, I think, since basic shopping for necessities is part of one’s daily life. Also, look at what is actually IN the third house in this eclipse chart: bad boy Pluto. And it so happens that Pluto trined Mars on May 16, an ominous transiting aspect if ever there was one. Mars is in the eleventh house of groups of people, so I would probably have avoided hanging around crowds. Let’s move on to looking at some lunar eclipses. I feel that lunar eclipses are more personal than solar eclipses. We can get some idea of what the eclipse will mean to us personally by looking at the chart. At the same time, one has to bear in mind that many times the effects of an eclipse can be so subtle, and be so gradual, that we may never link the eclipse to a growing interest in photography or music, for example, or to meeting someone who later proves significant in the course one’s life takes. I would like to look at the eclipses before the assassination of President Kennedy. Rose Lineman kindly provides both solar and lunar eclipse charts, set for both Washington, DC and for Dallas. The node is in the eighth house in all four. It hardly seems like Pres. Kennedy would have been any safer at home! For the record, Jupiter’s placement usually indicates where one is safe. 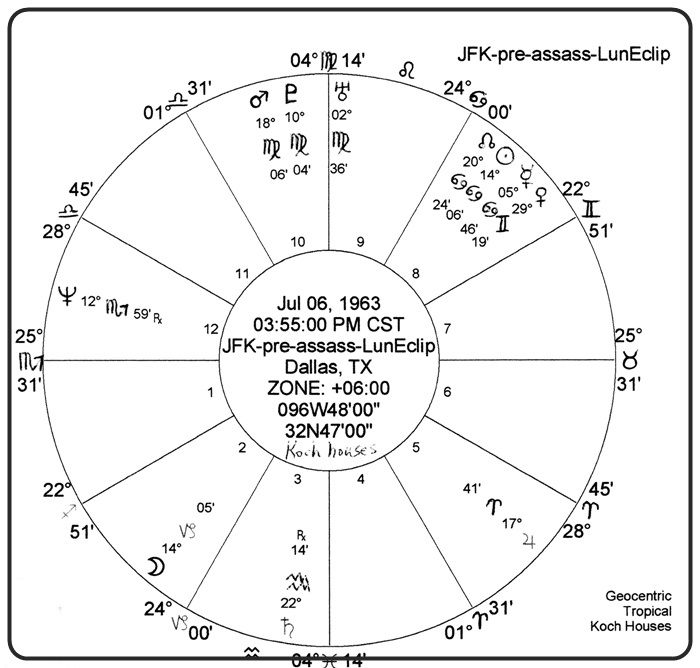 In the case of JFK, Jove is in the fifth house in the eclipse charts, which would suggest that he might have been safe in an amusement park, on Wall Street, in a casino, somewhere with children or artwork. Yet one must note that the eclipses set for Washington have Sagittarius on the ascendants, while the ones set for Dallas have Scorpio on the ascendants. This alone indicates a more intense cast to the events of the Dallas trip. Also some aspects tie in more sharply to the angles, and volatile planets are much closer to the Midheaven – which is itself a critical degree – in the Dallas charts. For example, chart rulers Mars and Pluto occupy the tenth house. Rose Lineman notes that Uranus at 2 degrees Virgo is not only nearly atop the Midheaven but is also conjunct the fixed star Regulus, representing “worldly position and power”; that Uranus is almost atop both MC and Regulus does seem to signify the sudden change in who holds the reins of power in Washington. One cannot isolate an eclipse chart from the natal or progressed charts of the principals involved. For example, Lineman notes that Kennedy suffered from the fact that progressed Moon, progressed Mars, and progressed Jupiter were all in the natal eighth house at the time of his death, AND since they were in Gemini, they squared the lunar eclipse Uranus, Pluto and Mars (in that order) in Virgo. So you see there are layers upon layers of connections between the events, the eclipses, and all the natal and progressed charts of the principal players involved. I encourage you to play with the chart data given below to make whatever combination charts occur to you. Try making triple- and quadruple-ringed charts. Lineman, Rose, Eclipses: Astrological Guideposts, 1984, AFA. March, Marion and McEvers, Joan, The Only Way to Learn About Tomorrow, 1988, ACS Publications, Lesson 9. .
Roell, Dave, Dave’s Method of Reading Eclipses, June 11, 2013, AstroAmerica newsletter, astroamerica.com. Sepharial, Eclipses in Theory and Practice, 1991, Sun Books. John F Kennedy, May 29, 1917, 3:15 pm Boston MA. Lee Harvey Oswald, Oct. 18, 1939, (unknown time) New Orleans LA. Assassination of JFK, Nov. 22, 1963, about 12:30 pm, Dallas TX. Pre-Assassination Lunar Eclipse, set for Dallas, July 6, 1963, 3:55 pm. Pre-Assassination Solar Eclipse, set for Dallas, July 20, 1963, 2:43 pm. 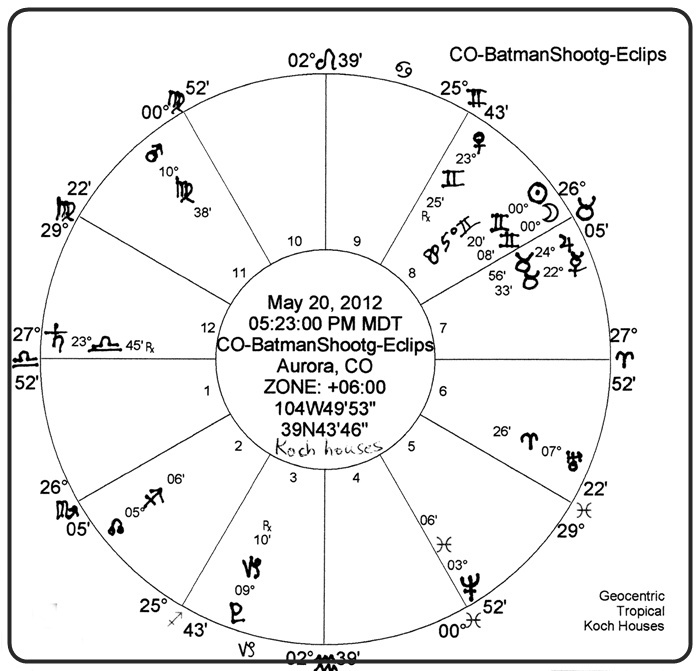 SOLAR ECLIPSE prior to shooting was on May 20, 2012 at 5:23 pm MDT. I did not know if a chart comparison would be successful when I started this little project, but I was intrigued enough to give it a go. I had no birth times for the two principals – Abe Lincoln and John Wilkes Booth – so I used noon for both. I did find a time for the fatal shot inflicted on the late President; a source said it occurred at 10:13 pm on the night of April 14, 1865. The President lingered for some nine hours before he finally breathed his last. This composite chart has Abe Lincoln in the center ring, Booth in the middle ring, and the fatal shot in the outer ring representing the transits. I should maybe have put the assassination in the center, since it is the only one to be specific as to time; you are free to construct such a chart on your own software and see what that yields. I will tell you that the assassination chart yields an ascendant of 9 degrees, 21′ Sagittarius (with the Moon rising at 9 degrees, 12′ of Sag), and the MC is at 26 degrees, 14′ Virgo. The way these charts interlock is at first glance far too complex to treat fully in one article. There are many planets in a narrow slice from 7 to 14 degrees of the signs, another group at 29 or 00 degrees of signs (which is a harmonic of the first group), and some more at 22 to 27 degrees of the signs. Let’s start by listing the planets at 7 to 14 degrees of the signs. In Pres. Lincoln’s chart: Mercury at 10 Pisces, Pluto at 13 Pisces. In Mr. Booth’s chart: Neptune at 10 Aquarius, Uranus at 12 Pisces, North Node at 12 Aries, and Jupiter at 8 Virgo. Mr. Booth has Jupiter, the planet of the actor, inconjunct Neptune in Capricorn and opposite Uranus in Pisces. In the transit chart of the assassination: Neptune at 8 Aries, Pluto at 12 Taurus, Mercury at 14 Taurus, Mars at 8 Cancer, Moon at 9 Sag. Listing planets at 29 to 01 of the signs yields this list: Lincoln’s Moon at 29 Capricorn, Booth’s retrograde Mercury at 29 Taurus and his Moon at 1 degree Sag; the transit chart has the North Node at . . .
Several years ago, it was in all the papers and was also mentioned in a book on the royals. But now in 2012, not many people seem to remember when Prince William had to be rushed to the hospital with a head injury. The event may even have been foreshadowed in an eerie occurrence at his baptismal ceremony. Reports were that the candle lit during the ceremony by his parents, Prince Charles and Princess Diana, flickered but did not go out. The Archbishop of Canterbury had baptized the infant, and handed the lit candle to the father, Charles. The windows were open and as a terrific storm gathered, a gust blew through the church, causing the candle to flicker. This was believed to predict a crisis in the young prince’s future, but that he would survive whatever it was – according to a psychic, Van der Post. Birth of Prince William was on June 21, 1982 at 9:03 pm. He weighed 7 lbs, 5 ounces. His full name is William Arthur Philip Louis Windsor. The accident took place on June 3, 1991, and he was admitted to Royal Berkshire Hospital. He was operated on at Great Ormond Street Hospital for a depressed fracture of the skull. Prince William was interviewed on Newsround by 10-year-old cancer sufferer Alice. ITN Source dot com adds that Princess Diana rode in the ambulance with William, although it is not clear which hospital was the destination for that ride. So – I made up a two-ring chart with the inner circle for Prince William’s birth time and the outer circle for the accident. It is frustrating when the things that you think will show up on a chart are not there, isn’t it? No Mars or Saturn or Uranus on the ascendant. He was having a lunar return, and transiting Sun was conjunct natal Mars in the sixth house of health. Mercury was transiting over Algol in Taurus in the fifth house of games and sports, opposite natal Uranus in Scorpio. What strikes me most is not that the transiting planets are merely contacting natal planets, they are transiting natal HOUSE CUSPS. The House Cusps are possibly more sensitive than the natal planets and can often be used to time life events. So that’s all I know about this one.